Website popups are increasing being used by retailers to catch visitors attention and convert them into paying customer. Popups can be extremely effective if used wisely and implemented with best practices. 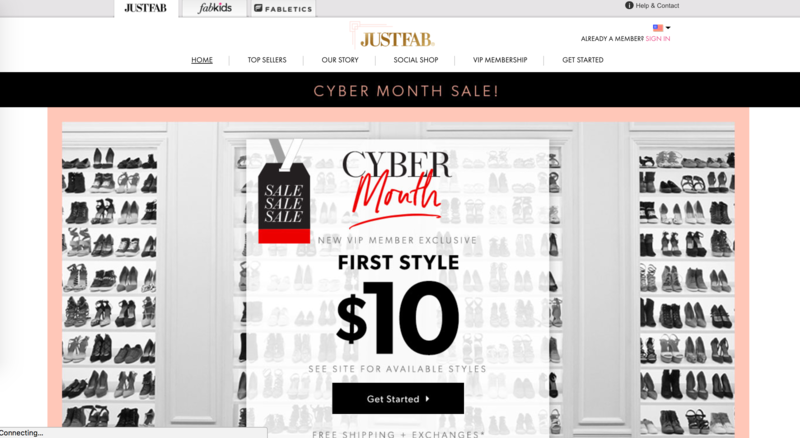 I scanned thru multiple online retailers, fashion designer to find which type of pop-ups they use and how they are interacting with website visitors. In this blog post, we will discuss how website popups can and are being used by various retailers. And how you as an emerging fashion designer leverage that to increase sales. Who doesn’t like gifts, especially when they are free. 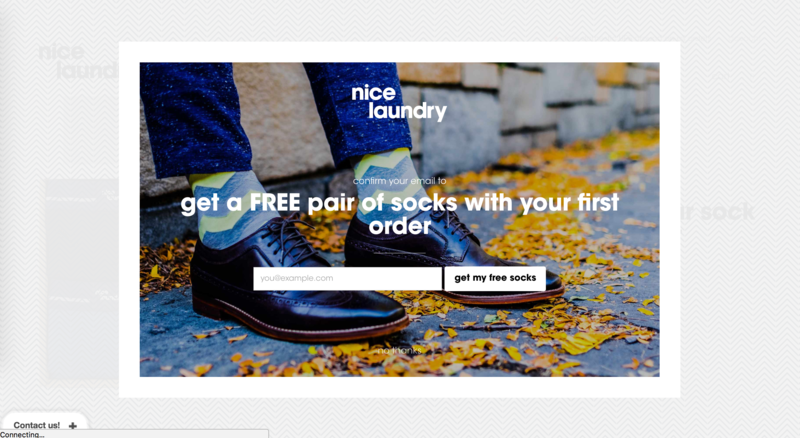 Fashion brands as Nice Laundry and Cents of Style use popups to collect emails by enticing customers with free gifts. There are 3 benefits for giving a free gift. • First, customers are much more likely to give their email in exchange for a free gift. • Second, as a fashion brand, you get users try your product. • Third, if your product is good, the customer is much more likely to share it on their social media and giving you thumbs up. Have you ever gone thru checkout process to purchase a $20 product, only to find out that the shipping was $7. I will admit, that I have canceled my orders few times because I did not want to pay for shipping. Or I would abandon the shopping cart and explore coupon websites in search for a free shipping coupon. Asics, Jack Spade, and other fashion brands understand this and offer customers FREE SHIPPING for minimal purchase or first-time orders or just because. Retailers also nudge customers into buying a second item by offering free shipping if customers spend minimum amount specified by the retailer. There have been times when I had purchased a 2nd item, only because it qualified me for free shipping. As I talked about in the previous point, that customers abandon shopping carts for various reasons, shipping could be one of them. But if you are unable to offer free shipping, you can entice the customer by giving them discounts if they abandon carts. 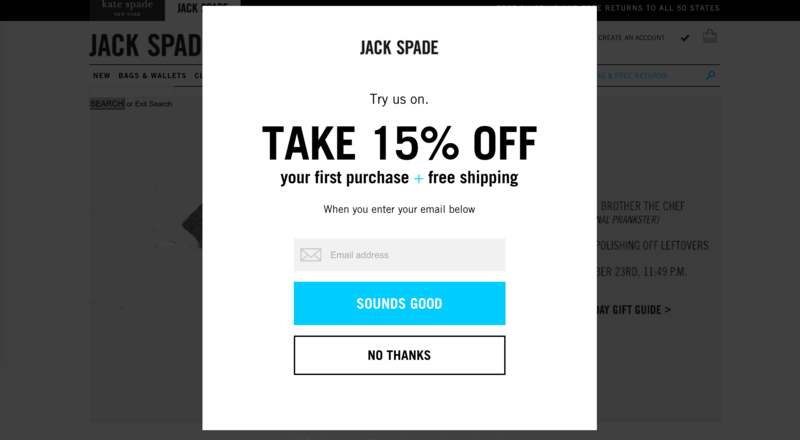 You can use popups to offer discounts right away or send an email, nudging the customer with a discount if they finish their purchase by end of the day. Offering time sensitive discount offers can be very effective. Fashion brands and retailers spend hundreds of dollars to acquire a new customer. It would be a shame if they don’t capitalize and catch the customer when the customer visits the website. 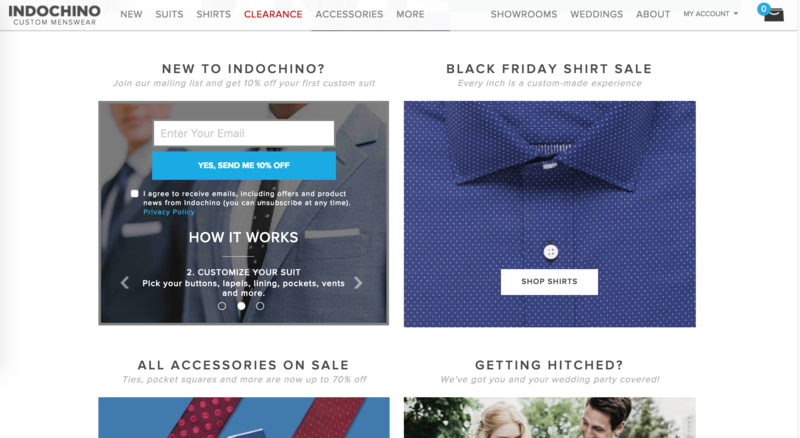 Fashion brands as Indochino, JustFab entice new customers with special incentives via popups to get them to drop their email or place first order. Holidays are one of the best times to up sell and convert clients. One of my favorite brands Beloved, nudges visitors during the holiday season to make a purchase and up sells them of various offers. • It catches the Christmas mood. • Their logo is wearing a Santa hat. • The image has snowfall, so it gets the customer in the holiday mood. • They show 4 diff discount tiers can customer can get. 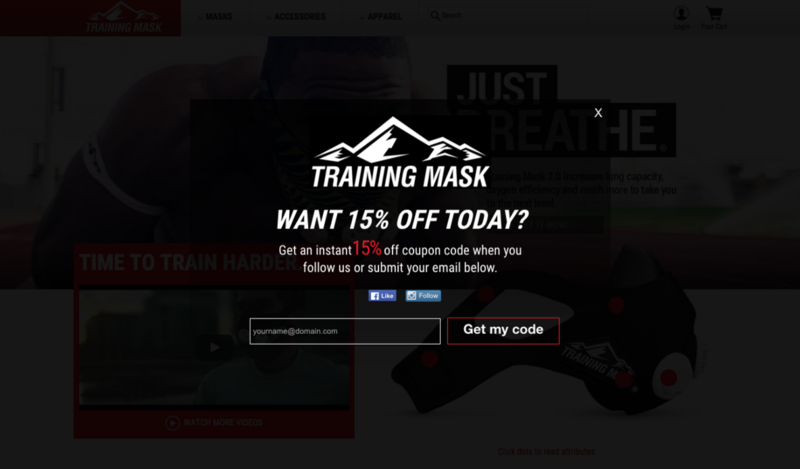 Website popups don’t necessarily have to lead to purchase. They can be used depending on what you want the customer to do or what you as a brand need at the moment. For example, if you are trying to increase your Facebook fan following, you can offer ‘soft’ pop up on the corner of your site that nudges visitors to Like your Facebook page. These ‘soft’ nudges are extremely powerful and can work well for you. Brit.co nudges the visitor to like their Facebook page and increase fan following. We all love winning and participating in contests. We have been doing it since we were kids, so as a fashion brand why not capitalize on that behavior. 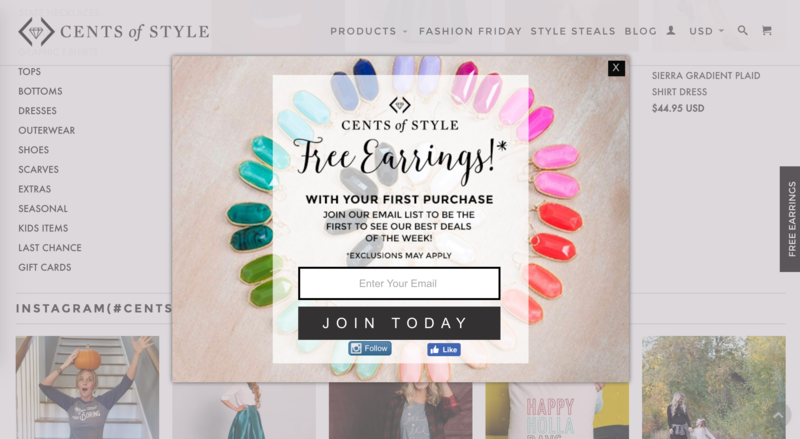 Fashion brands use popups to entice customers to participate in the contest and win a reward. You can go one step further, you can structure the contest entry in such a way, that the applicant has to use your product in a subtle way, in order to enter the contest. I am not a big fan of this technique because customers might feel pushed into using your product. But it can be used successfully with your ‘existing’ customers since they already are using your product. Of course, how can we forget about discounts. This the most common way popups are used in websites because they have one of the best conversion rate. • When the customer enters your website. • When they abandon the shopping cart. It all depends on what kind of customer behavior you want to target. One advice I would give is don’t use discounts too much on your site because then the customer will get into a habit of expecting a discount and would never buy anything at retail price. eg: look what has happened to mattress industry, they offer discounts 365 days a year. On a side note, if you are looking to increase your email list, you can nudge your ‘existing’ customers to invite a friend and receive discount. As we know, birds of the same feather, flock together. So, the likelihood that your existing customer’s friends would have a similar style, is higher and could convert into your customers. 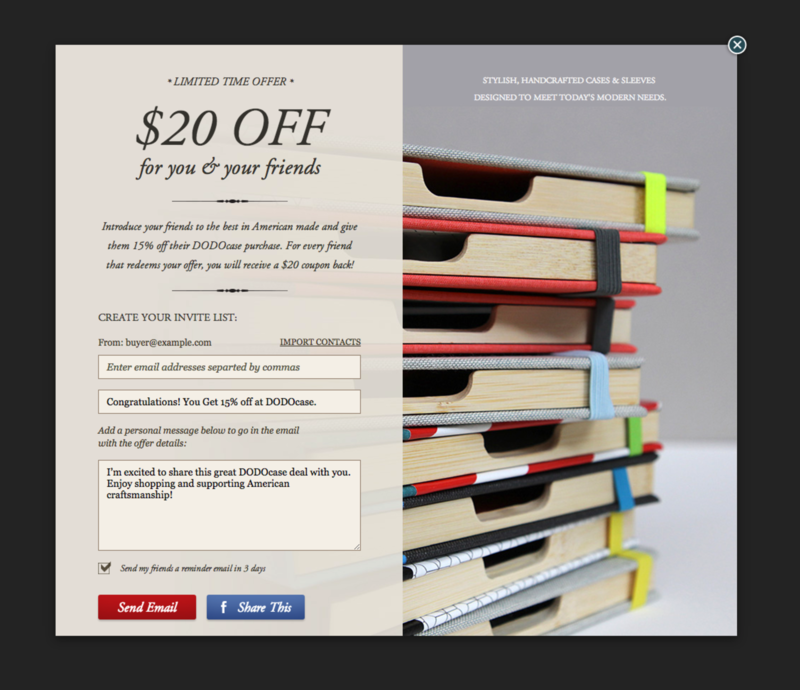 As you can see, Dodocase offers a discount if customer invites their friends. We all want to make our lives better and are always on the search for tips, tricks or how-to information that would enable us to do that. In my previous post, I discussed how fashion brands can target customers in “I want to do” moments. 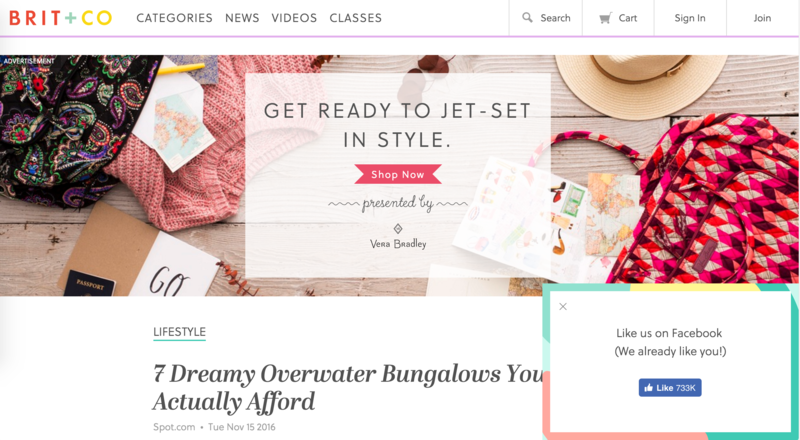 You should use website popups to offer, Life Changing hacks (as Cosmopolitan) or Ways to dress better for less. 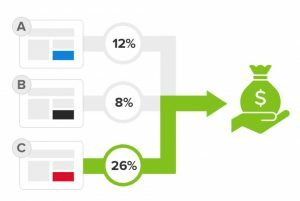 These popups are extremely effective because they are benefiting the customer, without them having to spend a single dollar or being nudged into a purchase process. As you can see, there is a multitude of ways in which you can use popups on your website to get customer’s attention. You can use one of these ideas or mix and match them to fit your needs. Now, that we know how retailers and fashion brands use popups; what would be the best way to create them. • Use odd numbers in the main tagline because they stand out. eg: 25% discount VS 30% discount or 7 ways to hack your makeup. • Use colorful background image that resonates with the offer. • Don’t ask for too much information. eg; some brands would ask for First name, Last name, Email etc. Just keep it simple and ask for email, you can figure out rest later. • Use words like “You” “Your” “FREE” “Learn” “Teach” etc in the ain line. Because the offer is for the customer, not for you. And data has shown that these words trigger emotional response and increase your CTR (Click Thur Rate). • Apply Discounts automatically: If customer is abandoning a shopping cart, and you want to give them discount so that they would come back. You should automatically apply the discount to their total and show them how much they would save. This would save them for doing the math to figure out how much are they going to save and increase their likelihood of going thru with the purchase. • Ask a question: eg: “Do you want a Free gift?” Who is going to say no to that. • Colors: In a popup, your customer will be to choose between Yes or No, selections. You want to make the Yes selection stand out. In order to do that, use bright colors of choice that leads to YES and light grey/dull colors of choices that lead to No. • Trust Signal: If applicable, show how many people have received the reward or bought from you. Social proof works well in lot of cases because people want to do what others are doing. There are so many tools such as Optinmonster, Wisepops, Omniconvert etc. that you can use to create popups for your website. But my favorite is OptinMonster . I use it for Rogueline and it has been great. 70% of users who exit your site will never return. OptinMonster‘s technology detects when the user is about to exit your website and enables you to entice them with offers. • A special discount to encourage them to complete the purchase. • An invitation to download and join your email list. Pop ups work great especially when they are time correctly. You can use OptinMonster to set the time when it should appear on your screen. If you are driving traffic to your blog through a particular blog post, you want to give user enough time to read your post. This is one of my favorites. You can A/B test different options for different customers to see which one converts better. You can test different layouts, colors, copy etc. The list is endless. So check it out and would love to hear what your experience is. 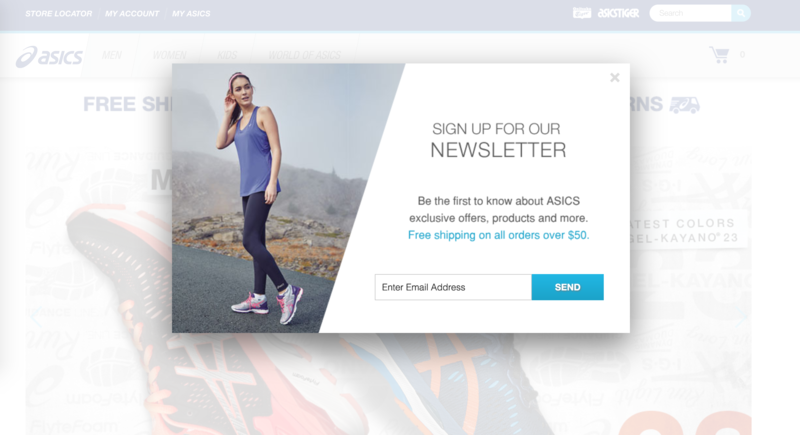 Pop ups are great ways to get users to finish shopping, sign up for email list etc. But use them properly and A/B test which ones work best for you. There is not set rule that one size fits all. Find the one that works best for your business and keep improving on it. thank you, these tips are super helpful. I am going to implement them on my site, especially when customer is going thru the checkout process. thank you, I am glad you find it helpful. this is so cool, thank you Vishal for sharing the ideas, I am looking forward to implementing it to my website. Can I create popups in such a way that they give different discount to different customers depending on how much they are spending on my site? thank you. 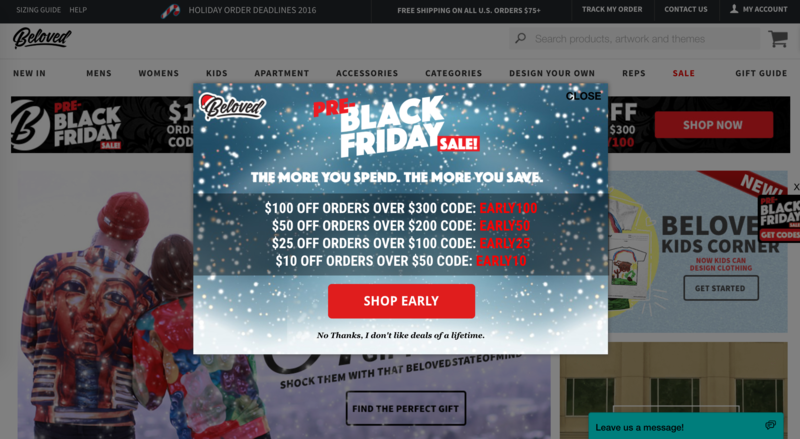 You can definitely create popups like that but it might require some development work because you would have to incorporate how much discount you would want to give your client based on the amount they are spending. I would recommend, talk with your developer and it should be an easy implementation but def would be worth it. I always worry these can get annoying but it seems there are ways to tailor them to be effective. 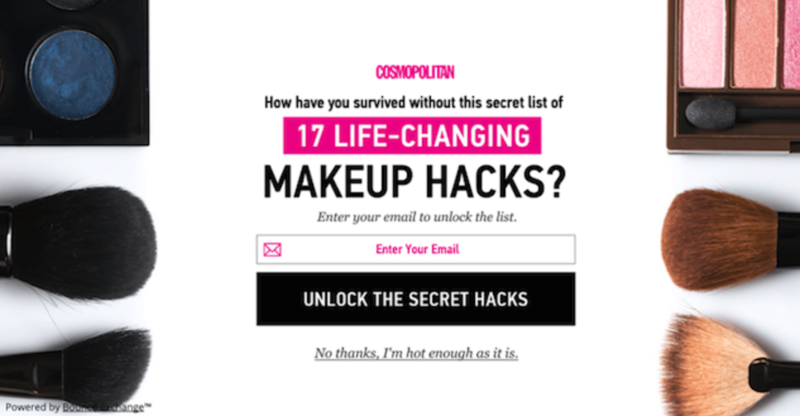 Great tips to make popups engaging.